Families with children who would benefit from additional help with their early speech and communication skills will have access to family reading sessions, local parenting pop ups and improved training for early years professionals, as part of a £6.5 million investment so children have the language skills needed to thrive at school. One of the local projects will introduce an easy to use online tool that informs parents of the basic child development stages, offering ideas for activities to do at home and signposting to further information and resources. Supporting families in some of the most disadvantaged areas of the country, experts such as health visitors, early years staff and family support workers will be trained to identify children with poor language and communication skills and to make sure the right support is in place so they don’t fall behind. Last year the Education Secretary set an ambition to halve the proportion of children that finished Reception without the communication, language and literacy skills needed to thrive within the next decade. On average, disadvantaged children are 4 months behind at age 5. That grows by an additional 6 months by the age of 11, and a further 9 months by the age of 16. Building on successful programmes already in place, the 8 projects will cover 27 local councils which will share expertise and resources, bring education and health services closer together to help improve children’s outcomes by age 5. Ask any parent and they want their child to have the best start in life. But we know that those from a disadvantaged background often start school already behind when it comes to communication and language development. This multimillion pound investment will provide better support to families in some of the most deprived areas of the country. No one is born knowing how to be a mum or a dad and parenting does not come with a manual, I want to support families with hints and tips to propel their child’s learning so they can go on to reach their full potential, whatever their background. The projects aim to improve the language and communications skills of children from birth to 5 years old, as children who start school behind often struggle to catch up. Programmes will be targeted at disadvantaged areas including three of the government’s 12 Opportunity Areas Doncaster, Derby and Stoke-On-Trent, providing parent-child workshops and outreach programmes to raise awareness amongst parents of the importance of speech, language and communication development. The 8 projects will create tools and techniques, including closer collaboration between education and health services, that will have lasting impact for children today and for future generations. Projects will improve access to early years support so that all disadvantaged families receive the same services across the region by reviewing and sharing best practice on the speech, language and communication initiatives that already exist. Councils will work with the National Literacy Trust to engage a range of professionals including early years teachers, health visitors and speech therapist to introduce pop up sessions for parents and creates an early years vision to best support children in areas where literacy is low. The council will also introduce an online tool to inform parents of the different child development stages and provide tips and tools to use at home. The councils will scale-up successful early learning projects in Stoke and Staffordshire, including the Speak Out project which will train and support parents, carers and staff to make early communication development a priority. The councils will also work with the National Literacy Trust to offer free advice and information to help parents incorporate ‘Chat, Play and Read’ activities into their everyday life. The ‘Flying Start’ programme will be expanded, which gives parents support from pregnancy to their child’s 5 birthday, prioritising children’s communication and language skills. Through workshops and information packs for families, the project aims to create better educational outcomes for young children resulting in improved employment opportunities in the future. The councils will tackle delays in early communication skills across areas with high numbers of disadvantaged families by making the same early services accessible in all 4 councils so no family misses out. Councils will work on a collaborative early years vision, which will include plans to train more staff and improve data sharing so the specific needs of every child is met. Introducing family reading sessions and will set up the ‘TALK Halton’ to assess 2 to 4 year olds using a screening toolkit to identify early language needs, and reduce the number of referrals to speech and language therapists by age five. The project will provide a range of workshops and training courses led by specialist to provide the best support for families. Using combined expertise across 10 local authorities the project will support children who are most at risk of falling behind in their early learning. It will implement a range of ways to ensure every child has the maximum chance of being school ready, including speech and language programmes. 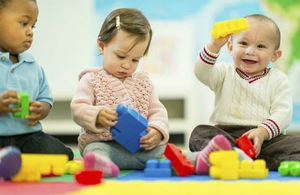 The councils will support children who are at risk of or display early signs of difficulty in language development through evidence-based early learning interventions, such as the Peep Learning Together Programme which helps parents make the most of everyday learning opportunities like listening, talking and playing. The funding is part of the Department for Education’s £8.5m early years local government programme which is improving how local services work together to improve early language, communication and speech outcomes. This follows an announcement in February that 1,000 health visitors would be trained to identify children’s early language and communication needs, beginning with 400 in areas of high need. Today the government confirmed a second wave of training for an additional 600 health visitors will be rolled out nationally from May, offering places to all local authorities, with priority given to the most disadvantaged areas.